New paper finds climate sensitivity to CO2 is lower than previously believed, strong natural variability in Southern Hemisphere | Watts Up With That? A commentary published April 25th in Nature Climate Change concludes on the basis of a new Southern Hemisphere temperature reconstruction that estimates of climate sensitivity to CO2 are lower than previously believed. “If the new reconstruction of Southern Hemisphere temperature is accurate, then estimates of climate sensitivity — the response of global temperature change to a given amount of external radiative forcing [mostly from CO2] — may be lower than those calculated based solely on Northern Hemisphere reconstructions10. The new Southern Hemisphere temperature reconstruction of Neukom et al referred to in this commentary shows the globe is only about 0.25C warmer than during the Medieval Warm Period a millennium ago, and that’s only by ex-post elimination of temperature proxies that didn’t have a hockey stick shape, as has been noted by Steve McIntyre and others. Temperature reconstructions of the past millennium rely heavily on Northern Hemisphere data. Now a Southern Hemisphere temperature reconstruction is available and sheds light on the complexity of the interhemispheric temperature relationship. For far too long the climate science community has grappled with an inconvenient truth: the vast majority of the datasets used to constrain temperature trends of the recent past come from the Northern Hemisphere. Over a dozen reconstructions of Northern Hemisphere temperature spanning the past millennium exist and have played a critical role in distinguishing natural from anthropogenic climate change. However, the extent to which recent temperature variations in the Northern Hemisphere resemble those in the Southern Hemisphere remains unclear. Such information is critical to a complete understanding of the mechanisms of global, rather than hemispheric, climate change. Writing in Nature Climate Change, Raphael Neukom and co-authors1 present a new, millennium-long reconstruction of Southern Hemisphere temperature by combining information from a wide variety of palaeoclimate sources. Although the new reconstruction resembles the Northern Hemisphere reconstructions in some key aspects — the anomalous nature of twentieth century warming being one of them — it also suggests that temperatures in the two hemispheres may have differed more than they have agreed over the past millennium. The best-dated, highest-resolution records of past climate variability rarely extend beyond the past millennium, making this time period an important test bed for quantitative comparisons between climate field reconstructions and numerical climate model simulations of past climate2, 3. Yearly temperature can be reconstructed from archives, such as corals, ice cores, tree rings, lake sediments and cave stalagmites, by calibrating their geochemical or physical signals against the instrumental record of climate, where they overlap over the past century. In this regard, extremely poor data coverage for Southern Hemisphere ocean temperature observations makes this calibration more difficult (Fig. 1). Scientists use a variety of advanced statistical techniques to extract the shared signals across a given network of palaeoclimate records. The uncertainties associated with reconstructed temperature estimates inevitably increase further back in time, as the number of available records decreases, but can be quantified using a variety of approaches. Figure 1: Instrumental temperature observations over the twentieth century. a, Map showing the average number of marine temperature observations per month from the International Comprehensive Ocean–Atmosphere Data Set (http://go.nature.com/qlA4c6) in the interval 1880–1950. Spatial coverage: 2.0° latitude × 2.0° longitude global grid. b, Same as panel a, but for the 1950–2013 interval. c, Northern and Southern Hemisphere yearly temperature anomalies over the the period 1880–2013, computed with respect to 1951–1980, from the GISTEMP dataset (ref.13 and references therein, http://go.nature.com/8iUuVX and http://go.nature.com/yy2NLB). One of the first such reconstructions was the so-called hockey stick, published by Mann et al. in 19994. As a reconstruction of Northern Hemisphere temperature spanning the past millennium, the hockey stick graph reflected a long-term cooling into the seventeenth century, the stick, followed by a sharp warming that began in the late nineteenth century, the blade. Multiple teams of scientists have subsequently generated dozens of alternative Northern Hemisphere temperature reconstructions, each using slightly different methods and data networks5. Climate model simulations that include natural forcings from volcanic eruptions and solar variability, as well as anthropogenic forcings such as greenhouse gases, reproduce many of the key features seen in the collection of Northern Hemisphere temperature reconstructions, within the combined uncertainties of the forcings and the reconstructions5. Such features include multi-year, hemispheric-scale cooling associated with large volcanic eruptions, as well as pronounced warming over the industrial era. The high level of data–model agreement suggests that scientists have a good grasp of the dominant mechanisms of climate change on decadal to centennial timescales, and that such mechanisms are fairly well represented in the current suite of climate models used to project future temperature. However, the new reconstruction of Southern Hemisphere temperature1 suggests that the climate model simulations of past climate systematically underestimate the magnitude of natural climate variability in the Southern Hemisphere. At first glance, the reconstruction contains the same basic features of the Northern Hemisphere family of reconstructions — a centuries-long cooling into the seventeenth century, and a twentieth-century warming of unprecedented duration and magnitude. But a close comparison between the Northern and Southern Hemisphere reconstructions reveals many intervals when the two series diverge for decades at a time. Notably, some of these differences occur following large volcanic eruptions, when the Northern Hemisphere cools significantly but the Southern Hemisphere does not, at least according to the new reconstruction1. The fact that many of these differences occur within the past 400 years, when the data networks from both hemispheres are most robust, makes it less likely that such temperature differences are artifacts of poor data coverage. That said, it is possible that small but cumulative age errors in single palaeoclimate records may smear out interannual variability in large-scale temperature reconstructions6, 7 — currently the topic of vigorous debate8, 9. If the new reconstruction of Southern Hemisphere temperature is accurate, then estimates of climate sensitivity — the response of global temperature change to a given amount of external radiative forcing — may be lower than those calculated based solely on Northern Hemisphere reconstructions10. Indeed, instrumental temperature data suggest that warming in the Northern Hemisphere has been greater than that observed in the Southern Hemisphere over the past two decades (Fig. 1c) — a feature reproduced in the current suite of climate models11. 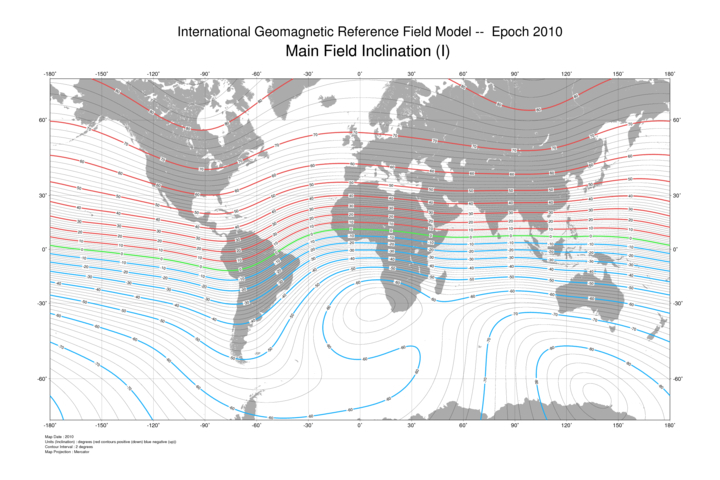 Therefore, this hemispheric asymmetry may be a fundamental feature of the climate system’s response to a change in radiative forcing12, whereby the ocean-dominated Southern Hemisphere acts as a buffer of sorts to global temperature change on decadal to centennial timescales. On the other hand, Neukom et al. propose that divergent hemispheric temperatures arise from strong natural climate variability in the Southern Hemisphere, and have been a constant feature of the past millennium. Given the new information now available from the Southern Hemisphere, climate scientists must consider a larger role for natural climate variability in contributing to global temperature changes over the past millennium. While the new reconstruction brings strong additional support to the phrase ‘anthropogenic global warming’, it also highlights the limits of our current ability to understand, and predict, global temperature variations from decade to decade. In other words, global temperatures will warm appreciably by 2100, but the road may be bumpy and full of surprises. April 30, 2014 in Climate sensitivity. I like it better without the selective highlighting. is this a climate-changer? looking forward to informed comments. And I question that even the second half of the sentence will make it, though it does make for a great ‘weasel clause’. Inter-tropical convergence zone is about 8 degrees north of the equator. This means that variations in variations in atmospheric climate over the tropics will be linked more strongly to the NH ocean gyres than SH. Thus NH variability is probably more strongly linked to variations in cloud cover and other variability. The usual sop to AGW. It’s amazing that no matter how much contradictory evidence they get, they can always find a nugget of AGW in there somewhere. There is much more variability in NH than SH, which seems to show a fairly abrupt change in direction around 1910 with almost linear down then up either side of it. The variability in NH looks more like a folded cosine ( rectified to an E. Eng mind ) than a straight harmonic ‘oscillation’. It is good to see someone looking at regional variation separately, even if it is just N/S divide. Bundling everything into global averages has been one of the major reasons for lack of progress in understanding climate in the last 30 years. Here is my comment quoting Phil jones that the 1730′s was the warmest decade until the 1990′s and that natural variability might be underestimated. Retreat! Perhaps all we need to wring our hands over is Anthropogenic Hemispheric Warming. Including no overall warming at all. So what they’re saying is … we’ve really no idea, having two hemispheres is cool but really confusing, so we’ll insert a few get out clauses and summarise with ‘keep the funding rolling’ or it will be a bumpy road ahead. I am now even more of the opinion that “climate science” has only scratched the surface of actually understanding the climate mechanism. An analogous state of actual knowledge would be an understanding of human anatomy at about 1200 to 1400 AD. This paper is interesting although I was aware of the hemispheric anomaly difference from my ongoing plot of the HADCRUT3 & 4 series ( GL, NH, SH, NH-SH,). The difference averages about 0.1˚ ( SH cooler) over the past 150 years but a few years ago got to 0.3˚, a record of some note. And blow me down, I’m not a climate scientist. A list of questions about climate models. Why are all the climate models made in 1978? They hardly had computers back then. Back then they still believed in global cooling. Wouldn’t a climate model that was made in say 2005 use the actual temperature data collected up until that date? Shouldn’t it only start deviating from the actual temperature record after the day of it’s creation? Why is it already 2º higher than the actual temperature on it’s first day? Does it then go back in time to be wrong over previous 30 years? 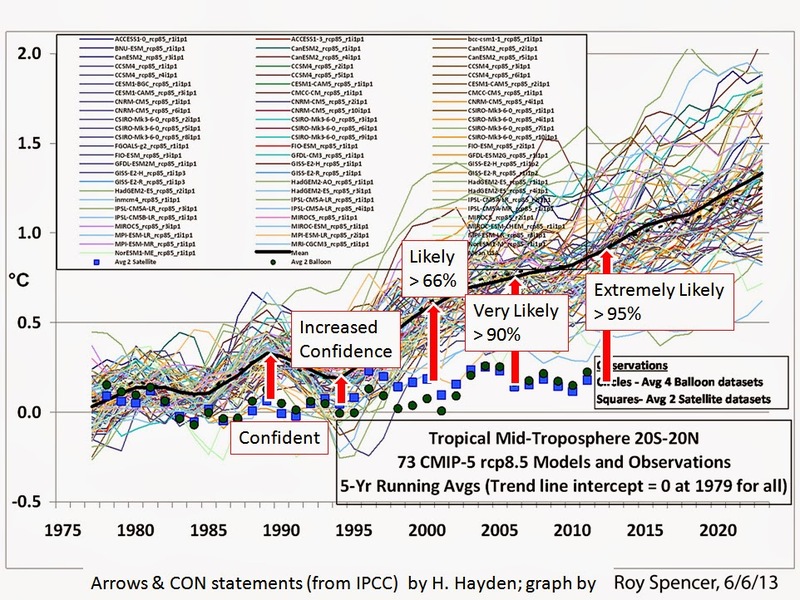 Or, back to my earlier question, are all the climate models listed on the above chart created in 1978? If so wouldn’t they adjust their model at least once a decade back to the actual temps? How can they be wrong for 35 years and still get funding? I seriously don’t get it. Always “unprecedented.” They love that word. I have a solution which will allow them to reconcile the data for both hemispheres: add more thermometers in the past, especially at higher elevations. Possibly 3 or 4 at Machu Picchu, to get some good 15th century temp data. So, in a nutshell: the models and proxy data climate reconstructions are going to broadly agree because the analysis of historical proxy data produces hockey sticks and the models assume a relationship between co2 and temperature that produces hockey sticks. The instrumental and satellite temperature records don’t (so far as we can see) produce hockey sticks. This means that the instrumental and satellite temperature records don’t broadly agree with the models. So there is something wrong with either the proxy reconstructions or the instrumental and satellite records. Either the methods used to reconstruct historical temperature through statistical analysis are unreliable or there is something (take your pick) suppressing the CAGW signal in the instrumental and satellite temperature records. I know where I’ll place my bet. It always amazes me how these kind of papers get past peer review! They make a number of unsupported statements – like climate models do a good job of simulating the past. How can that possibly be true when the modellers themselves admit, and this paper shows, that they have very poor knowledge of what drives natural ‘variability’. That poor knowledge stems from a denialist attitude to solar variability (other than in the visible spectrum) and the nature of the dreaded ‘cycles’ and oscillations. All the models do is fit the parameters until they get the answer they know from the past record is about right – in this case, since the LIA in their book cannot be caused (i.e. modelled) by solar processes that they have limited knowledge of – then it must be down to lots of volcanoes depressing temperatures. The reason the southern hemisphere has not warmed as much as the northern is obviously an oceanic phenomenon – but there are TWO possibilities, one that the oceans absorbed the extra heat, the other that the oceans did a better job of DISSIPATING the heat to space. The southern ocean has an unimpeded circumpolar current – unlike the north. Thus surface heat is continually channeled into the zone of permanent heat loss. In the north, the sub-polar gyres caused by the land constrictions, allow heat to build up at depth. During global warming periods the oceans are in accumulation mode and the heat is slowly transferred to land by prevailing westerlies. Climate shifts are caused by changes in northern cloud patterns – when these heat stores are no longer insulated from the polar night, they cool – but first the heat migrates to the surface. Then suddenly, its gone, and the westerlies cool. Its a cycle. This paper also states that the 20th century rise – both rate and magnitude, is unprecedented! No supporting material other than reference to the Medieval Warming Period and as far as this excerpt goes, no indication of the uncertainty level on their 0.25 C ‘warmer than’. Let them show similar analyses for all of the Holocene warming episodes recorded in ice-data – plenty of time when it warmed at a higher rate and to a higher level. Unprecedented in the last 1000 years, maybe – though the rate from 1920-1940 is the same as 1980-2000, if not the magnitude. The current magnitude is NOT without the bounds of natural variability and can be at least partly explained thus far by long-term cyclic recovery for the LIA trough. The 0.25 C may be anthropogenic – but that is hardly proven – it is assumed by radiative forcing theory. The parameters of that theoretical function are now under closer scrutiny – IPCC started (1990) out by backing a factor of 0.88 times the computed RF in watts. They were advised by their own experts in 2007, that this perhaps ought to be reduced to 0.44. Other experts suggested 0.3 as a lower bound, and one or two would go lower still. The lower it goes, the more must be attributed to natural forces. These factors are built into model predictions of the future. Thus UKMO did a recent study of the impact on global warming of a solar shut-down – a new LIA. They put in many ‘good’ parameters for the solar power, but chose the old 0.88 instead of 0.44 (and those IPCC experts who advocated the lower figure were also chief advisors to UKMO – so they ignored their own experts). Of course, the resultant prediction is that CO2 warming is only slightly affected – but the full Monty returns with renewed vengeance. Gerry Meehl at NCAR has a more honest model – at least with regard to the RF factor – and temperatures flat-line to 2060. Both models cannot bring themselves to use parameters that would show a cooling – Meehl’s model unaccountable starts from a baseline 1.5 degrees warmer than 1950 – the same place that ‘standard’ models arrive at by 2015! I have yet to work through the logic of that. I did write a critical commentary for Journal of Geophysical Research – it went through the review process, which did pick up a couple of ways in which I had not fully understood the methodology – and got a first rejection, which I then rejected, met the criticisms, but the final rejection was simple – why don’t you go away and run your own model! This despite one of the reviewers indicating that critical comments were rather rare and should be welcomed. I will return to the fray – because the UKMO paper still stands with most people, including many atmospheric scientists unaware of how ‘political’ considerations (what I would call prior commitment) affect the parameterisation of models. I did point this out – hoping that ‘the community’ would accept that kind of feedback – but the reviewers were unanimous – such comments have no place in a ‘scientific’ journal. How else do we get through??? Jones, G.S., M. Lockwood, & P. Stott. (2012) What influence will future solar activity changes over the 21st century have on projected global near-surface temperature changes? Meehl, G.A., J.M. Arblaster, and D.R. Marsh (2013), Could a future “Grand Solar Minimum” like the Maunder Minimum stop global warming? Geophys. Res. Lett., doi:10.1002/grl.50361. Given the new information now available from the Southern Hemisphere good thing we found that SH, but wait what about the global ‘One Tree of Yamal’? Mikey won’t like this. Maybe this has something to do with why Antarctic sea ice has been setting daily maximum record levels for ice area and looks like it will continue doing it for a while. showing different forecasts for the NH and Global temperatures. The answer to “why 1978?” Is surprisingly simple. That marks the date of the launching of the third weather observation satellite by NASA, thus giving scientists (and psuedo-scientist) a uniform data set from which to make projections. Since prior data is in different formats it is not easily assimilated into computer models without a lot of annoying work. I often wonder what the forecasts would be if the satellites had been available,say, 10 years sooner. This is a good quotation to cite in response to the warmist jibe, “Why don’t you publish your critique in the peer-reviewed scientific literature?”–implying that journals are open to being forums for debate and that peer reviewers in this rogue science aren’t mere gatekeepers. The models weren’t made in 1978, they just use data starting in 1978 because that’s when the first reliable satellite coverage became available. Although there is available data from balloons and ground stations prior to that, the coverage wasn’t as global as a satellite system provides. It is also coincidentally, a low point in global temperatures, which provides (serendipity at work) a much steeper trend than using a prior start date. The models are problematic in any case. None have been ‘validated’ in the traditional modeling sense of the term and none can be called ‘skillful’ in a predictive sense. Many climate processes are poorly understood (or not understood at all) so they implement individual ‘parameters’ to represent them. This allows them to ‘tune’ the model by changing the value of the parameters to create a ‘hindcast’. That provides 0 assurance that the model is capable of even coming close to predicting future trends. Such is the challenge of working with a system that is acknowledged to be a ‘complex, non-liinear, chaotic’ system like earth’s climate. To me the article implies that there are two separate hemispherical climate sensitivities (CS), a NH one and a SH one, which are distinct for very important physical reasons. It implies to me that the SHCS and the NHCS should not logically be combined into a global CS if sense of understanding the Earth-Atmosphere System is a criterion for climate science. If that’s the case, then CO2 is a truly amazing molecule (if it is responsible for AGW) because it can discriminate between hemisphere’s (and in some cases between counties & States) for it’s affect. There was no debate that it was a meaningful stick to average in with the others to get a global climate picture. The same old sticks have grown tiresome, apparently. Hey, yes I think CO2 is amazing but only in its miraculous ability to inspire some activism biased scientists to resort to exaggerationism. As to my original comment, it seems reasonable to expect CS to be dependent on geographical location. Given that 90% of the world’s population lives north of the equator, it makes me wonder as to how much of an influence the urban island heat effect has on “global temperature” in the southern hemisphere. Agreed. All the nitpicking and false flags are a diversion from a realistic historical based approach. There are a multitude of players in the earth’s climate. The least is our SUV’s. applies to skeptics as well as AGW proponents. Observationally verified climate sensitivity research possibly trending as you mentioned should logically be motivating many new researchers to get to work in order to be in on it. The IPCC is now effectively bypassed by the irrepressible independent scientists like you. Thanks. Thanks for trying to explain it to me but I still don’t get it. I get that the satellite data didn’t start till 1978, but let’s say model was created in 1998 wouldn’t it use the satellite data up until that point then deviate from there? I made this graphic to explain what I’m trying to say? You don’t see any repeat of the classical warm periods (Minoan, Roman, Medeival)? What we saw in the ’90’s doesn’t qualify – these were 300 year-long roll bakes. The NH is 60 percent water, 40 percent land. The SH is 80 percent water, 20 percent land. Therefore SH climate is less sensitive than NH climate. Hey, can I get someone to pay me for this? Elmer asks a good question and his graph would be one way to display the data with two assumptions. First, elmer is implicitly assuming that the models are all ‘random walk’ models – that is, the future value may depend on many factors but those are all additive to only the exact most-recent temperature. If, on the other hand, your model assumes that there are time lags to whatever effect is driven by the prior temperatures, the proper start date of your predictions may be somewhat before your most recent observation. Think for example if you wanted to predict my bank balance but had no data on the exact timing or magnitude of my paychecks or mortgage payments. You know there’s a lot of variability but you don’t know why. If you start your predictions from the first of the month, you will be arbitrarily high – or maybe low. A better start-point might be the average of the prior month. The correct place to display that starting average is the 15th of the prior month, not the first. That’s a minor factor for most of the climate models, though. More relevant is the second implicit assumption that you only care about the prediction going forward. What elmer’s display fails to present is each model’s relative success at hind-casting – matching the prior observations. A more useful chart would extend each of the model lines backwards from the crossing points and compare those lines to the observations. So for example, in his chart, the light green line should cross the red line in 1998 but it will wobble around the red line during the prior period. Likewise, the blue line will cross in 2003 but diverge prior and so on. That would be an accurate representation of what each model predicted (both forward and backward) at the time the prediction was made. If you actually tried to draw that graph, however, it would quickly become an unintelligible spaghetti chart with no way to compare which model is really doing the best at matching the observed temperatures. In elmer’s example diagram, both the dark blue (2008) and dark green (2010) models are higher than subsequen observations but which is worse? There is no easy way to tell. If you want to compare the predictive power of the models, it is more intuitive to establish some common point that the lines will all diverge from. The convention is to normalize the lines (shift them up or down) just enough that they all exactly matched the 1979 actual observations. You are effectively saying that “If my 2008 model had existed in 1979, it would have predicted this.” That normalizing assumption makes it possible to visually compare the models despite their different actual start times. Figure 1 is surely using false data as it shows continued warming after the 98 El Nino in both NH & SH, how and why is this being used for any scientific purpose? Thanks, so they all hind-cast back to 1978, I guess that explains it. I still think that whenever they created the model they should start at the actual observed temperature and that the hind-cast should line up with observed otherwise your wrong on day one. Figure 1 has a caption which says it uses the GISTemp dataset. This does indeed show warming since 1998, at about 0.06 deg C per decade. No matter how slow they try to do the “walkback”, eventually they will have to admit that CO2 does not cause warming. And in the age of the Internet, a slow walkback doesn’t work like it used to. The shame will still be waiting. It will never go away. The fist-biting error at the very foundation of the hoax is too huge to ever be hidden. Climastrologists claimed a figure of -18C for the planets surface in absence of an atmosphere. That claim of 255K without DWLWIR and atmospheric cooling is locked in. It can never be erased. And it’s wrong. Totally and utterly wrong. Climastrologists provably calculated the surface temperature of the oceans as if they were a near blackbody, instead of a selective surface over 71% of the planets surface. This results in a 98C error that negates not just AGW, but the entire radiative GHE hypothesis. Even highschool students will be able to understand that the atmosphere is cooling the oceans not warming them. The climastrologists won’t be laughing this one off. The basic physics of why water acts as a selective surface not a near blackbody was done in 1965 at Texas A&M university. In the end there are no excuses that can save the climastrologists. It’s quite obvious really. The CO2 molecule is a very smart molecule. It is quite aware of the Coriolis effect (thanks to the correct section in Wikipedia which I have been assured that the molecules have access too). So, in the Northern Hemisphere they “fling” their “trapped heat” towards the surface of the Earth. Likewise in the Southern Hemisphere they “fling” their “trapped heat” away from the surface. Thus the climate sensitivity is positive (>1) in the Northern Hemisphere and negative (<1) in the Southern Hemisphere. Given the higher albedo over the larger percentage of land (versus ocean) in the NH this results in more global warming in the NH and less global cooling in the SH. So the sum is greater than 0. So all we have to do now is push a couple of the Northern land masses down below the Equator (I nominate Greenland, those folks always look pale, they could use a little tan) to even things out. There is your mitigation strategy. Oh, I almost forgot; /sarc off. “Therefore SH climate is less sensitive than NH climate. Could it just be that the northern hemisphere difference is caused by non Co2 based factors that have been ignored because of a sad and immature fixation with AGW?